Sometimes it hits me like a freight train, the realization of how big a crater mercury poisoning gouged out of my life. I was just minding my business the other morning, opening up the medicine cabinet, getting out the deodorant, admiring my newly-waxed armpits. I was thinking about summer and bathing suits and cute little tank tops, when I was pulled up short. There was something wrong. I could see bruises. Lots of them. All over my armpit there were irregularly-shaped tiny wine-dark bruises. I checked quickly. They were on the other side too. My heart fell into my boots. What could have caused this to come on so swiftly? They hadn’t been there the day before, when I’d been at the salon getting the waxing done. It wasn’t a reaction to the wax, I went all the time and this had never happened before. There was only one thing it could be. In a few seconds my life unraveled. It’s starting up again, I thought. I’m sick. I have to get back on ALA right now. Mercury’s done something to my blood. I have to drop everything and focus my life on fixing this. Chelation, herbs, cleanses, supplements. But will that be enough? Should I go to the doctor too? What if it’s too late? What if I’m going to die? Seriously, all of that ran through my head before I had the sense to poke at one of the ‘bruises’ and feel how sticky it was. I picked at it with my fingernail and it peeled right off. It was wax. Duh, the ‘bruises’ were little blobs of wax that had been left behind during my beauty treatment, and the wine-colored sweatshirt I’d worn home had left a very convincing bruise-colored fuzz where the fibers had stuck to the wax. I gasped in relief. I was saved. I wouldn’t have to give up my life. Nothing was lost. My brain reeled itself back from the doomsday scenario, and before my eyes, restored ordinary reality. The life that moments before I considered normal and boring was handed back to me in beautiful little packages. I could still go on all the fun trips I had planned for the summer. I could eat regular foods, I wouldn’t have to live on some extreme cleansing diet nobody had ever heard of. I could continue to work. I could continue my life. I wouldn’t have to step back from everyone I loved and retreat into the bunker to fight an invisible war against mercury for the next two years. I had to ask myself, How much do I take this incredible life for granted? Even me, someone who has fought so hard for this, how can I take my health as a given? But like I said, these moments come along every now and then and hit me like a freight train. And I remember that nothing is certain, and every day that I think and walk and work and feel and live this ‘boring’ life is nothing short of a miracle. Thank you for your book and blog….I’ve been having a tough time of it with the dental visits and now DMSA. But, I am getting better and can relate to your story. While some symptoms are better or gone, new ones have arrived. But, overall, I am getting better and some days I am able to function better. Like yesterday for example…my lawn mower kept dieing. I cussed out loud hoping young neighbors were not within earshot. After I completed that task, I cooled myself with a glass of ice water and remembered…it wasn’t that long ago I wasn’t able to to even start the mower or tolerate the heat:) I went to bed happy. More important: GETTING THE MERCURY NOT IN. You have to learn how test, if the substance you are going to inhale, ingest or gets in contact with your skin contains molecules of mercury, so that it doesn’t enter your system and disturbs it. How much easier life would have been for even the most exquisitely mercury sensitive among us if we had never been exposed to the stuff! I just read your book and thought that you recover was about the long gluten free diet you followed. Mercury, Celiac, and intestinal candidiasis share many common symptoms. Since, you didn’t give a precise conclusion about gluten intolerance in your book, I assumed you never recovered of it. I am battling a severe candidiasis that began slowly and after antibiotic intake, but after learning, I realized all my health problems began after my first dental work and amalgams that I even swallowed a piece. There was a year, where I had to go to the dentist around 4 or 5 times for the same amalgam that never was done right. They had to fix it many times. You know, drilling, etc ! I also worked as an electrician respiring gases from fluorescent broken lamps many times (they have mercury) Anyway, depression was my first symptoms, later, food intolerance, compromised immune system, candida overgrowth, gluten intolerance, disautonomia, etc. I am now on my 5 round of 50 mg of ALA according to Cutler’s system. Still, very sick but your memories give my hope. I have spent a fortune in supplements, candida books, medical test and nothing shows up. So, the end of your book is written in this block. 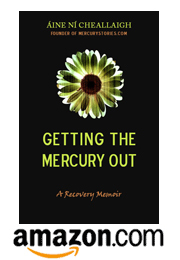 These good news about how you can tolerate mercury now could be a happy end to your story. By the way, have you ever hear about Enterolab ?? It is an special Lab that test gluten intolerance in a unique way. They test gluten antibodies in stool, genetic tests, etc. You can order the tests online without Dr script. They are famous in the Celiac community. One of this test may give you the green light forever about gluten intake in spite you already feel good eating it. I wish to follow your steps in this journey and to recover my health and life. I already lost my marriage, my job, my health and the most important, my happiness. Thanks for writing the book. Thanks Jorge! Good luck with chelation. I hope it all goes well for you and you begin to feel better soon! Thanks for your answer. I wanted to say that the good news are you can tolerate GLUTEN now, I made a mistake in my first post. I will report my chelation progress time to time and hope Gluten be a closed page in your life. Get Mercury Stories by email!